Perhaps you wouldn’t naturally associate the phrase ‘what does luxury mean to you’ with a Google Pixel phone. That would be an oversight. Through their multi-sensory exhibition in Selfridges, Google are changing perceptions and positioning their product within the luxury landscape. Quander sent along their designer to find out more. Greeted with a circular door which leads into a dark corridor. I am struck by the radiant colours that emanate from the dark centre of the room, but this, I am told, is for later. I’m excited to discover the experiences of the tour and I have to remind myself to be patient. James, a tour guide, greets us and hands us our Pixel phones, either a silky white or a matt black which perfectly reflects the luxury aesthetic. The phones are ready to go with the bespoke app already loaded and awaiting our details. We are asked to enter our email address, names and a password. Once we have accepted the terms and conditions we are in, the camera is launched and we are ready to go! James takes us to the first exhibition, a room full of large spherical mirrors, each encompassing a quote from the artist. The low lighting and the big round mirrors are reminiscent of the moon. The mirrors created an expansive space which drifted off into the distance and bled back into the darkness. The cool basement filled me with unease and isolation, the mirrors my safe refuge. I am then shown how to put the phone to portrait mode, with a shake of the phone we can change from rear to front camera in an instant, time for us to get creative. The mirrors provided a cool perspective, creating a four-dimension of the room. Ignoring the questioning faces I wanted to test the selfie capabilities I had heard so much about and I was not disappointed. The phone captured my four-dimension environment perfectly, added depth to the photo by focusing on my face entirely and adding a slight blur to the background. The output of the images reflected the quality of a DSLR camera but with the ease of a smartphone. To move to the next experience we followed a carpeted walkway slightly raised off the floor. The floor below was painted a shiny black to give the illusion of moving water which, with the dark environment and moving lights, was very easy to believe. I was greeted by two heavy black curtains and told to enter into the cocktail personality room created by “Mr Lyan” who are well known for their world-renowned cocktails had set up a libationary bar area within The Flipside Exhibition. While a cocktail personality room might be slightly unexpected at a phone launch, it’s another example of Google’s innovation and their desire to create an all-encompassing experience. To show how our choices determine the type of cocktail we like to drink, I was told to look at the three tables all with different items. Most of the items were past their prime, and slightly withered a powerful reminder of one the luxury items that is time. Looking at the withered yet still vibrant sunflowers reminded me that there is still beauty in death. For me this was the most poignant display, the contrast between the hope given by the lights and the despair and isolation of the dark backdrop was incredibly effective.The camera here on the Pixel came alive, picking up on every finite detail and colour, so good it was as though I could still feel the softness of the peacock feather. I was asked to choose a cocktail based on which table attracted me the most. Once I had made my decision I entered a vast room, all painted white. A small square of rice paper was submerged into the solution and lightly placed on my tongue. I found this slightly strange and perhaps a little too personal. However once I got over the awkwardness, I was hit with a variety of flavours. I had chosen a smokey whiskey, golden in colour. It wasn’t to my personal taste but I enjoyed being involved in a new experience. I then left the heavenly cocktail room and entered back into the darkness. The room then opened up with a viewing plinth overlooking the “lake” surrounding the exhibition created by Lowe – a designer who believes that nature, craft and tradition work hand in hand, signifying a future in which the earth’s resources are protected through intelligent design and creativity. We had all become masters of the portrait mode and James now explained Panorama mode as well as 360 photo. The user interface is smooth; long gone are the days where you have to hold your breath so as not to wobble the panorama frame. With the Pixel you simple point to where you want the first picture and hit the capture button. I really enjoyed the amount of thought that had gone into this part of the experience. Whilst it was a simple concept, it was one that could have easily been disappointing. The viewing platform allowed me to take a minute and soak in all the artists’ hard work. Each experience so different from the other, yet tied in so well with the other themes. Feelings of being on a different planet washed over me again, along with a sense of peace and calm. I could faintly hear the beach experience created by Gareth Pugh, washing away London around me. Back on the winding trail we headed towards the strange floating craters which made me feel as if I had stumbled on a science fiction set, only this is set is laced with designer Louis Vuitton bags and shoes. James spun the floating planets and the room filled with twirling items bearing the LV monogram, he then explained how to change to slow mo video. This was the first of the experiences that we could touch, and my excitement that it was Louis Vuitton was evident. After recording the video he pressed play the designer bags started to spin on the creators axis, but they then slowed and kept perfect clarity as they twirled in the incandescent lighting. The lighting of the room had no effect on the video output for the Pixel, with the videos devoid of that noise grain effect most videos have when filmed in low light. We waved goodbye to Mr. Vuitton’s legacy and neared the end of the tour. On our way out we were told that the main premise of the idea of the Google Flipside came from the shadows cast by the main stairwell – illuminated circles across the main wall. Having become masters of the Pixel camera we headed back to the kiosk to hand back our phones. We were asked if we enjoyed our experience of luxury and were given a goodie bag to remember the day. Before we leave we were told to head over to the “luxury portrait booth” which we first saw when we entered the Flipside experience. I walked over to where everyone was queueing, the bright lights and rich colours pulled me into a heavy trance. Every now and again a deep tone would ripple through the room to signify that the user had chosen a design for backdrop, which rose through my body like a cold wind, and caused the hairs on my arms to stand to attention. This was particularly important to the experience as it tied all the senses together. It was now my turn. 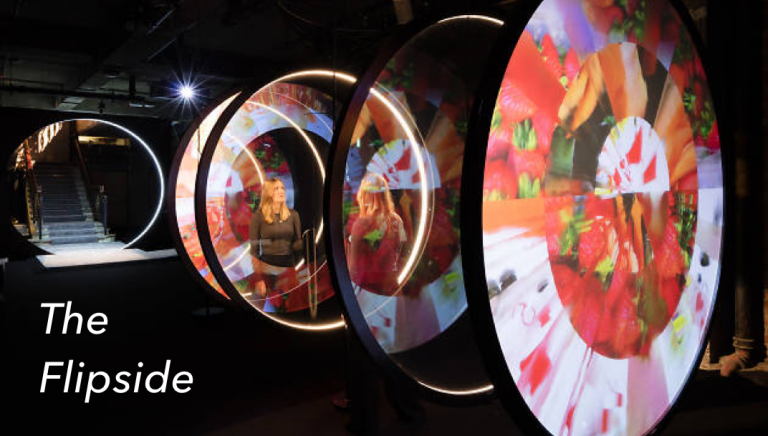 The experience consists of two large LED circular screens where a variety of images were displayed to choose from. I flicked through the images using the dial and quickly picked 3 at random. Once I was happy with my choice I pressed the centre of the dial and that deep tone ripple through the room once more. A three second countdown began and my picture was taken. As soon as I had put my coat back on I was then guided to the printing station. The whole experience was very quick, and was a nice personal ending to a great exhibition. I got yet another freebie! This time it was my image with my chosen collage, encased in a sleek black sleeve, branded with Google Pixel. The camera of the Pixel 2 was very easy and great to use. Google have become the leaders in camera software as they are one of the first companies to use AI. Instead of creating a 3D depth map by comparing the different views from the two different locations, Pixel 2 uses a dual pixel sensor, comparing the right and left sides of the pixel to determine what objects are close to the camera and what is in the background. Machine learning software then applies the blur effect to the background.Unlike other market competitors such as iPhone 8, Samsung and many others, Google concentrated its energy on making the one camera as great as possible, instead of incorporating two.